I got about a week behind on my writing prompts, but I’m catching up now. This photo, which I took in 2005, was last Monday’s prompt. 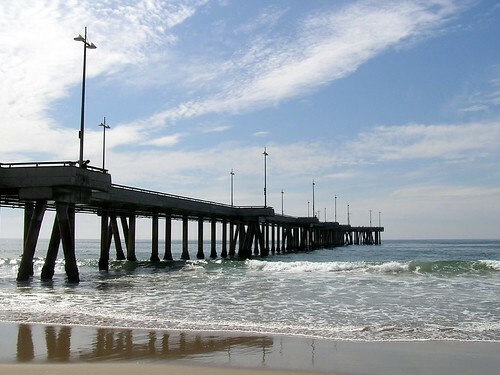 The sun shone down over Santa Monica Pier as the woman walked its length, toward the ocean. It seemed strange that there was no one else there, but it was a Monday, and most other people would be at work. She walked without haste, but with regular, brisk steps, her heavy bag slung over one shoulder and her other hand up to shade her face from the noonday sun. Below, the tide rolled in and broke over the wet sand, its unceasing sound as soothing to her as a mother humming a lullaby. Overhead, clouds streaked the blue with white, and the occasional gull flapped its arc across her line of sight. The breeze brought the sea to her nostrils, and she breathed it in deeply, its clean freshness a welcome change from the atmospheric cocktail of smog and pollution that surrounded her just outside the door of her apartment. She reached the end of the pier and stopped there, staring out. Without thinking she stepped up onto the foot rail of one of those coin-operated binoculars, gripped the warm, solid metal of the scope with her hand, and swung her body as she had when just a child. A little less satisfying, now, but the motion still felt right, as right as climbing the guardrail – which she would certainly have done if there were any gaps big enough for her feet, but some intelligent civil engineer had foreseen her impulse and made the wall out of concrete, putting a stop to her action before she could get so much as a shoehold. Instead, she dug the tips of her sneakers into the corner of the wall and the floor, and leaned forward with her elbows on the metal rail. What would it be like to jump into the sea? She’d always wondered, all the way back to being a little girl brought to the beach on weekends. The current wouldn’t carry her very far, not this close to the pier – but it was the leap that caught her imagination, not the waves. What would it feel like to make that decision, to throw one leg over the guardrail and then the other, and drop? They said time slowed down in moments like these. Would it feel like hours before she hit the water? Would she regret? Or would she suddenly know the things every living person wanted to know, too late, with no one to tell and no time in which to tell it? It was not an action one could reverse, and it was this which attracted her: the decision, the certainty, the confidence to do something that could never be argued or undone, not by herself, not by anyone. Wow. I didn’t expect that. Impulses, questions, decisions, control. So much to think about in a moment that seemed so simple as it began. I like the way you wrote this. Thank you, Ré. I feel that parts of it get awfully close to cliché territory, but this is how it emerged when I did the freewrite, and I wanted to preserve that. I do like the direction it goes, though! Thanks, creativeboys. 🙂 I appreciate you stopping by!